How to Be Prepared If Your Kitchen Catches Fire! Lori was cooking her usual breakfast – a bit of fried bacon. She took some of the bacon off and tipped the pan to drain some of the grease out, but some of that grease dripped to the bottom of the pan. When she put the pan back on the stove, enormous flames erupted from it! She immediately pulled the pan off the burner and grabbed some water to throw on the grease fire. As soon as she poured the water over the flames, they erupted even higher – splashing oil and flames everywhere. This is a classic example of what NOT to do if there is a grease fire. 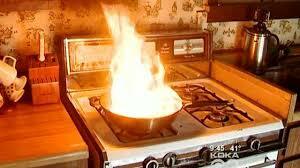 Water can put out a lot of fires but, in the case of grease, water and oil don’t mix. So instead of the water putting the flames out, they sink past the flames immediately and evaporate while simultaneously sending hot oil in all directions. Follow this guide for tips on what to do if you ever encounter a kitchen fire. Don’t carry the pan and fire outside. There is a lot that can happen from your stove to the outside and just swinging the pan the wrong way or bumping something could send flames flying onto your house and your body. Act quickly. You maybe have 30 seconds before the flames will get out of hand. If you have a metal lid, or even a cookie sheet, put that tightly over the flames, turn off the heat, and leave for at least 20 minutes. Taking the lid off continually to check if the fire is gone could reignite it. If you have baking soda, you can put that on the flames to suffocate the flames. If you have a non-water fire extinguisher, that would also work. It’s always a good idea to keep one in your house and kitchen in case of emergencies. Don’t pour water on a grease fire. The flames will erupt even larger, up the walls and into your face. If you have an electrical fire in your house, regardless of if you put it out, call the fire department. The fire could still be in your walls and you would have no way to tell. Avoid electrical fires by not overloading your outlets with appliances. To put out an electrical fire, use a fire extinguisher, but never douse it in water completely. For a microwave fire, close the microwave and unplug it if possible. Have it checked by a technician before using it again. An essential tip for dealing with a kitchen fire is to become familiar with your fire extinguisher. When you purchase an extinguisher, make sure that it can be used for all types of fires. You don’t want a water only extinguisher sending water onto your grease fire flames. If a fire starts, you won’t have time to sit and read the directions to the extinguisher, which is why familiarizing yourself with how to use it beforehand is imperative. Pull the pin out of the extinguisher. It won’t work otherwise. Aim for the base of the flames, not the top of the flames. Hold onto the handle and press down on the lever to activate it. Just let go when you want to stop spraying. Spray low in big, horizontal sweeping motions until the fire is extinguished. Always remember that if it is a large, roaring fire that it is best to get everyone out of the house and call the fire department. A small extinguisher can’t handle something on a large scale, and your safety is more important. If it is a small contained fire, it is still best to send the family outside, but you can decide to stay and continue attempting to put out the flames while the fire department responds. Either way, bodily safety must come first.